Spout & Non-Spout Liquid Pouch Packaging Market size is estimated to surpass USD 10 billion by 2024; according to a new research report by Global Market Insights, Inc. Necessity for light weight and easy to carry products particularly among travelers and tourists will drive the spout liquid pouch packaging market size. Improved consumer experience accompanied by ease in consumption and stain free properties will support the industry growth. Rapid urbanization along with busier lifestyles enhancing the processed food demand will support the product scope. Superior economic viability along with ease in handling are among key properties propelling the non-spout liquid pouch packaging market growth. Effective storage of high viscous as well as low viscous fluids including juices, lubricants & oils, shampoo, and detergents will drive the application scope. Zero leakage and puncture resistance are among lucrative properties driving the product adoption. Inclination towards eco-friendly materials along with favorable government regulations on sustainable packing innovations will augment the industry demand. Shifting trend towards raw material cost reduction among manufacturers will fuel the product scope. However, raw material cost variations due to fluctuating petrochemical prices may hamper the business growth. 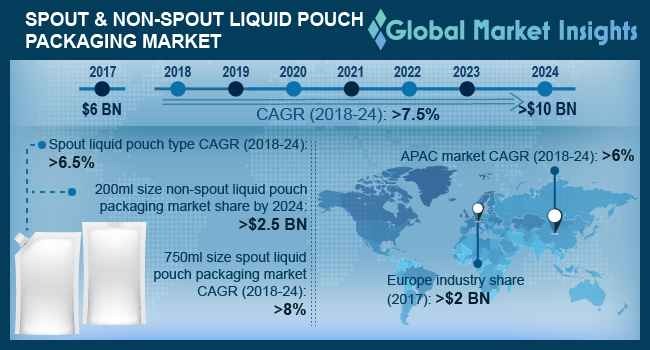 Spout liquid pouch packaging market will witness CAGR at over 6.5% up to 2024. No spillage along with high protection layering are among major properties driving product scope in food & beverage, pharmaceutical, and industrial applications. Non-spout liquid pouch packaging market dominates the industry share. Design flexibility along with product innovations are among key factors fueling the business growth. Food & beverage applications in non-spout liquid pouch packaging market was valued over USD 3 billion in 2017. Shifting consumer preferences towards processed food and fluid diet due to increasing health awareness will proliferate the application scope. Extensive durability through flavor retention, nutritional value and freshness maintenance are substantial properties driving product penetration. 200ml size exhibited a dominating share in the spout liquid pouch packaging market share. High application scope owing to light weight, compatible strength along with adoption of standardized sizes in food & beverage applications will propel the segment growth. Rising penetration in personal care and home care segments particularly for soaps & detergents will support the product demand. Three-layer laminates accounted for over 45% in the spout liquid pouch packaging market in 2017. Ease in high quality design printing on film surface will supplement the segment demand. High application scope in food & beverage applications owing to enhanced shelf life will support the product demand. However, four-layer laminates are expected to witness the fastest CAGR owing to increasing demand from industrial applications. Global industry share is highly fragmented owing to presence of large number of unorganized small-scale players along with global players. Ampac, IMPAK Corporation, Uflex, Tetra Pak International, Sonoco, Swiss Pac, and Weyerhaeuser Company are among major players. Expanding distribution and sales network coupled with research & development investments are among vital strategies adopted among industry players. Other prominent players include Constantia Flexibles, Clondalkin Group, Südpack Verpackungen, Cellpack, Huhtamaki Oyj, DOW Chemical Company, and Smurfit Kappa.